The entire galaxy knows that George Lucas basically worshipped Akira Kurosawa and his legendary film The Hidden Fortress, from which so much of the Star Wars universe was spawned, and that Flash Gordon flashed through his imagination long before Luke Skywalker was a twinkle in his eye from far, far away. And that Yoda is so Zen because he was influenced by meditative monks. And that makeup artists looked to the porcelain faces of Japanese geishas when it came to putting on Queen Amidala's face. Some of the space-age ideas Lucas and his staff have blasted off with are not so obvious. Unexpected inspiration emerges from things as random as exotic dishes, inside humor and dusty finds collecting cobwebs in the back of some antique store. Chewbacca and the Ewoks may look like what we call canines on this planet, but what breeds? While real fascist empires influenced the ideology and battle tactics of the Empire, did they also influence their uniforms? Where did that bizarre thing Lando wears to disguise himself in Jabba's lair even come from? Strap yourself tightly into the passenger seat of the Millennium Falcon, because finding out these 11 strange Star Wars origins might surprise you more than if Darth Vader himself confessed he was your father. If you're sitting in a dark movie theater when the screen suddenly projects blue text reading A long time ago, in a galaxy far, far away, you definitely know what movie you're watching. But would you be able to tell so easily if you time-warped back to 1936 and that screen was black and white? You'd be looking at the opening of Flash Gordon. While George Lucas wasn't around to experience a mysterious world hurtling from the skies into a theater, the sci-fi-obsessed 12-year-old did watch the series on TV as part of Adventure Theatre. From there spawned that signature text crawl that the entire galaxy now believes is exclusively a Star Wars thing. It only makes sense that an extremely hairy extraterrestrial Bigfoot would be inspired by what is known on Earth as a dog. George Lucas only had to look at his canine companion Indy, who was riding shotgun with him on the way to the studio, to see an overgrown gun-toting sidekick to a space cowboy. The Wookiee species was about to come into existence. If you zero in on Indy's facial markings, it's as if Chewie looked into a mirror from another planet. While it might be a stretch that Lucas imagined him as being civilized, since his only method of communication is brays and growls and what sometimes sounds like a foghorn, mutating an Alaskan Malamute into a bipedal alien Yeti is just the next phase of evolution. You probably know that artificially intelligent C-3PO is a metallic reflection of a Kurosawa character, but how did the concept get polished in brass? Threepio was actually inspired by an earlier model. The droid you're looking for is evil silver anthropomorphic robot Maria from the 1927 German expressionist sci-fi film Metropolis. That's about where the similarities end, since Maria gives people deadly hallucinations. They wouldn't be compatible on a dating site. 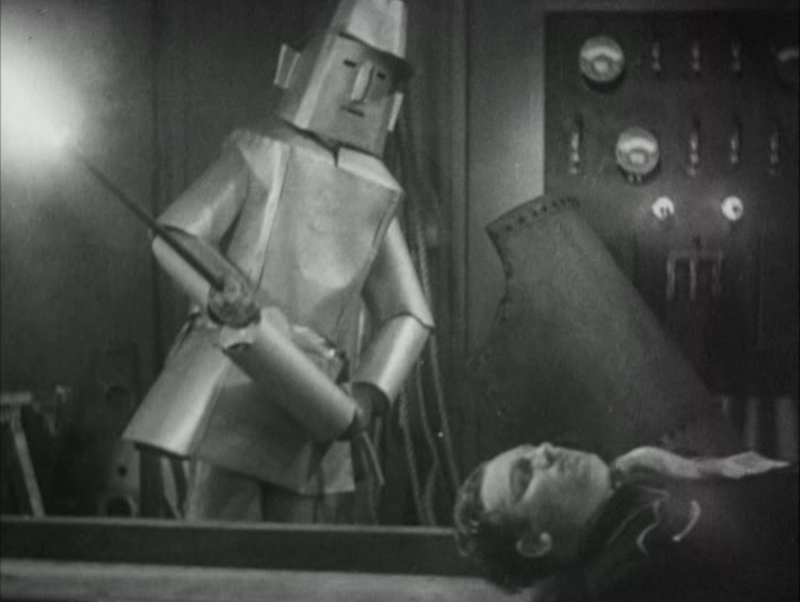 As for those chronically squeaking limbs, the brass man takes after the Tin Man from The Wizard of Oz. His face has a creepier origin: a steampunk-ish 19th-century firefighter's smoke helmet that could pass for a double of the droid's head with gaping eye sockets. The helmet that is synonymous with pure, unadulterated evil is an amalgam of cinematic chromosomes. You know how you're always hearing the labored breathing of Lord Vader because he can never take that thing off if he wants to survive? That's a ghost of the oxygen helmets worn by the subterranean race of Muranians in the 1935 film The Phantom Empire. It also echoes a darker style of antique steampunk smoke helmet (to the left of C-3PO's vintage doppelganger above) made by ironically-named company Vajen-Bader. Someone back then had spectacular foresight. The more sinister side of the mask is that Nazi headgear and WWII gas masks also influenced the look of Dark Lord. The swarms of soldiers whose uniforms look like an homage to their leader, except in ghostlike white and having ditched the cloak, are actually a visual mashup of Apple computers and the Nazi war machine. Somehow this bizarre combination of i-everything and the Dark Side of history clicked for Star Wars: The Force Awakens costume designer Michael Kaplan. The same fascist regime that partly inspired Darth Vader's headgear influenced theirs as well — the Empire/First Order in general disturbingly mirrors the brutally hard-edged aesthetic of the Nazis and other fascist regimes. As for Apple, Kaplan was always asking himself what the technology giant would do if faced with designing uniforms for space soldiers. The result was slick retro-futurism. How do you dream up an otherworldly headpiece of abalone shells? While shooting Episode II - Attack of the Clones, costume designer Trish Biggar was out to dinner with her crew and had ordered the abalone by some cosmic coincidence. Seeing the iridescent shell was quite illuminating. Abalone is often used in jewelry and ornaments, so the thought of incorporating it into a lavish costume really wasn't that far out. Shimmering rainbows are just the thing to accessorize an otherwise funereal black and white dress. Biggar asked the waitress whether there were any extras lying around the kitchen, and what was once destined for the trash would soon appear on the big screen as the crown of an alien queen. Are they primitive teddy bears? Zombified taxidermy specimens? An alien species of Shih Tzu? None of the above. The creatures that seem cute until they nearly roast Han Solo alive on a spit (total misunderstanding) and then redeem themselves by taking down the technological Empire were actually inspired by George Lucas' other dog, a Griffon Bruxellois. This breed is our planet's answer to the Ewok. Compare furry faces and you'll see where these forest-dwelling, stick-wielding mammals got their mustaches and snub noses and googly eyes from. The resemblance is extraterrestrially eerie. Lucas is also rumored to have used the equally hairy Lhasa Aspo for inspiration, though legions of Shih Tzu owners may be convinced otherwise. Jabba was almost Chewie. Sort of. In an evil way. The vision George Lucas first had for the gargantuan gangster was essentially a huge furball that could easily be mistaken for an extra in Braveheart. He was supposed to be human, which also meant he was supposed to be wearing clothes, and his fashion sense consisted of shaggy furs over some sort of tunic and a bullet-studded belt. Since the idea of Billy Connolly on steroids wasn't working out, Jabba Desilijic Tiure morphed into a "fat, slug-like creature" to match his slimy business deals. Visual effects supervisor Phil Tippett answered Lucas' request for something galactically grotesque with a one-ton garden slug of a puppet. What a makeover. While it might look like a samurai helmet in a museum was what inspired Lando Calrissian's helmet, that wasn't what initially sparked costume designer Nilo Rodis-Jamero's imagination. Its fearsome look actually mutated from a baseball glove that was an inside joke between him and engineer Wade Childress, who would often end up caught with the glove on his head after Friday afternoon pickup games. That turned into a few Polaroids which evolved into prototype sketches for the tusked headgear with a monstrous gaping maw. No one knows when those nightmarish teeth came in. Maybe it just looked more exotic. Those bat ears and bulging eyes are the product of some imaginative DNA, and no, it didn't involve splicing the genes of a gecko and a tarsier on a petri dish. The face that would make for a memorable mug shot was actually based on several humans. Stuart Freeborn, the makeup artist who brought the legendary character into being, bears an uncanny resemblance to the wise old alien sans enormous ears and levitating powers. He only had to look in the mirror for inspiration. Freeborn wanted to inject some intelligence into that iconic green face, so those wise old wrinkles and knowing gaze take after — you guessed it — Einstein. Makes perfect sense for a Jedi Master. Someone went there and made an action figure out of this atrocity. Star Wars may have recently flown into the wonderful world of Disney, but George Lucas was a diehard Disney fan before the fantasy came true. He then made a magically shocking admission at the D23 expo aka DisneyCon: Jar-Jar Binks, the excessively annoying kazoo-voiced Gungan who inspired such legendary merch as the infamous tongue lollipop, is based on Goofy. You can't deny the chronic awkwardness and mirror image of that gangly physique. Never mind that they both always manage to trip into some embarrassing situation. 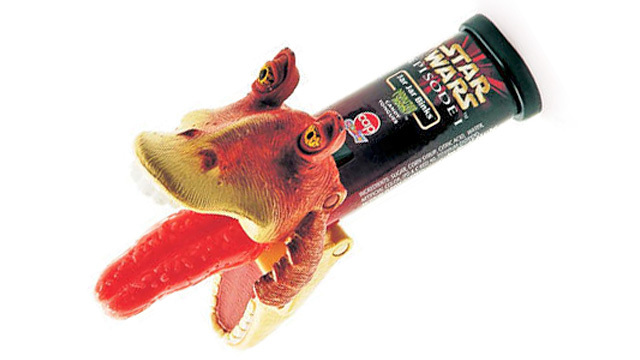 Jar-Jar is the most irrelevant character in the entire franchise, and yet Lucas managed to sneak this thing into a space opera because of his Goofy obsession. What. I think I'm scarred for life.